At the beginning of his book The Ravenous Brain, Daniel Bor talks about having been at the crossroads between science and philosophy during his university years. In other words, it was the choice between an empirical and concrete versus a rational and abstract approach. He chose the former and became a neuroscientist. Two thoughts (or sets of firing neurons) went through my mind (brain): One, he should have chosen philosophy because of its more speculative, hence attractive and less rigid nature, and two, this book was going to be a real challenge for me as my brain tends to have a hard time understanding neuroscience or practically anything rooted in or associated with biology. (Strangely enough, it loves astrophysics though on a very basic, dummy-kind of level). From the onset, I noticed a fallacy at work here. Science is the quest for patterns (due to how our brain is wired for “chunking” or combining incoming data) and for a fact-based truth that can be tested and retested with a pronounced focus on statistics and numbers. It should then come as no surprise that there are even serious-minded, albeit heavy-handed attempts at measuring consciousness with numbers. Philosophy, however, is less interested in the question of what (content) or how (process) but rather in its provocative cousin of why (reason and purpose). So patterns may be useful and may give us vital information about the nature of existence, but they still give us few clues about the reason of our being here, its raison d'être. The root problem of science is the assumption that their observed and observable facts (seeing is believing) is able to override the philosopher's mainly intangible or speculative thoughts and ideas. The dilemma Bor proposes in the first pages is one I have struggled with myself. I have no problems accepting and embracing evolutionary psychology; in fact, I find that topic fascinating and have and will continue to write and post about it, but I cringe whenever anybody tries to reduce human thought, behavior and consciousness to the common biological denominator, the floating jelly- and walnut-like substance in our heads. This problem goes back to Descartes who exposed the physical parts of existence, that we are complex biological machines, but who struggled to infuse his view with a “soul” (apparently located somewhere in the pineal gland). This futile and desperate attempt is often dubbed the “Ghost in the Machine.” Bor, in fact, claims that our very consciousness, the “I am, therefore I exist” part of each of us, that chattering voice in our head is not only an evolutionary by-product but it can be deduced to certain areas and parts of our physical information-processing brain. The evidence sides with the neuroscientist. Brain scans reveal essential information about which parts of the brain are used when consciousness is at work. Brain damage to certain areas diminish awareness and may lead to a vegetative state or a coma. And in other cases, brain activity in the prefrontal parietal network (I am simply copying and pasting this word from Bor's book) can be increased through medication leading to a heightening of consciousness levels. All these observations have come to be factual and are generally stable and consistent. Put differently, our brain not only controls our behavior, but our personality to boot. If I think of a certain subject or have an idea, a specific part or rather a complex network of interactive areas of my brain will be activated; if I take drugs other parts will be influenced and affected and all of these cause changes in my sensations and thoughts. It leads to the conclusion that we may be nothing but our brains, the “most complex lump of matter in the known universe,” which is our master and commander, according to Bor. I have difficulty swallowing that because it does not feel “right” and it would reduce notions of spirituality to nothing but physical processes. For example, we can look at a spiritual or even enlightening drug experience in terms of brain chemistry. We can analyze the feelings and sensations and break it down into biological processes. But that still misses the qualitative, subjective relevance of that experience, something that science is trying to come closer to but has, up to now at least, generally failed to achieve in a satisfactory manner. My next point why it is difficult to accept the fact that our brain is running the show is that I simply do not understand its workings and mechanisms too well. Here I admit to two personal shortcomings followed by a pretext: I lack the knowledge of how the brain works because I find it difficult and confusing and because I am rather prejudiced against biological processes. My pretext: that is how my brain is wired. Fortunately, those factors did not stop me from reading on. 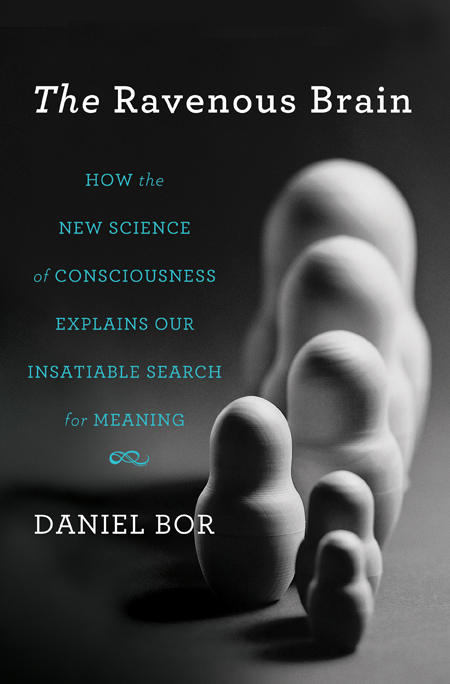 Although I still hold onto spiritual and metaphysical truths, I have now, significant thanks to Daniel Bor, a somewhat better understanding (and yes even appreciation) of our brain. And that is indeed no small feat. Although this book is delightful for novice and expert alike, Bor's style, images and examples will make the most biologically-resistant, -impaired and -challenged (I am talking about myself here) see and understand the whats and hows of the brain. Neurons are compared to staff emails of large companies with its different departments, including those of security and management, while our brain is depicted as the noisiest (and perhaps most dangerous) part on Earth with all its chatting and shooting (and gun-toting) neurons. Although the subject may look “dry” and sophisticated (evolution and brain mechanism explaining the rise and production of consciousness, or in his own words and subtitle: How the New Science of Consciousness Explains Our Insatiable Search for Meaning), there are pearls of wisdom held together by a witty and playful style (“ravenous” what an excellent, creative and humorous use of a modifier for a scientific book!) and various (though not enough for my literary taste) personal references and vagaries, such as his aimless and distracted walk around the country-side where Virginia Woolf and Ludwig Wittgenstein used to roam or his baby daughter's frolicking walk on the author's back. There is also a sheer abundance of useful and practical knowledge in this book. I learned that octopuses are the geniuses of the ocean, that hits and blows to the head and concussions often result in low level brain damage and the loss of neurons (hence my staunch reluctance to register my son for hockey in the future), and that sleep and coffee are more than good for you; they can prevent serious mental illnesses, for instance. Furthermore, Bor mentions the importance of consciousness and its relation to mental health, as well as the pitfalls of “chunking” showing us that the way our brain organizes thoughts and schemata can easily lead to faulty logic or prejudice if not closely attended to (though I still consciously harbor irrational beliefs, such as superstitions and religion). His final reflections on meditation are very helpful but seem a bit rushed. It would have been interesting to see it developed and expanded in perhaps another book (? ), a sequel to this fascinating and enlightening investigation of consciousness. All in all, this book may not have changed my brain, I mean mind (!) but it certainly taught me many a thing for which I am most grateful. My only regret is that I did not read this book (because it had not been written yet) in my undergraduate years of psychology where it would have been an extremely reliable and valuable fountain of information and knowledge.